Many types of animals eat grass as their main source of food, in some places, even small areas of grass are valuable. Many types of animals eat grass as their main source of food, in some places, even small areas of grass are valuable. And grass is important in many sports, notably with those played on fields such as American football, Association football, baseball, cricket, and rugby. In some sports facilities, including indoor domes and other places where maintenance of a grass field would be difficult, grass may be replaced with artificial turf, a synthetic grass-like substitute. Sports such as golf, tennis and cricket are particularly dependent on the quality of the grass on which the sport is played. You can find six grass photographs from different visual angles in the 3D PageFlip Grass Theme package, different colors, differnet types, even different seasons. Very beautiful and helpful to make your 3D magazines more vivid and amazing. Download URL: homepage 1. Start 3D PageFlip program, design "Page Layout", set logo file, logo link, base color, tilt angle, background config and so on, click "Apply Change"; 2. Click 3D book icon and then choose "Export Current Settings as Themes", define output folder and theme name to save directly; 3. When you want to use, just click the 3D book icon to choose "Import Theme", then view your imported theme in template selection interface to choose and use. 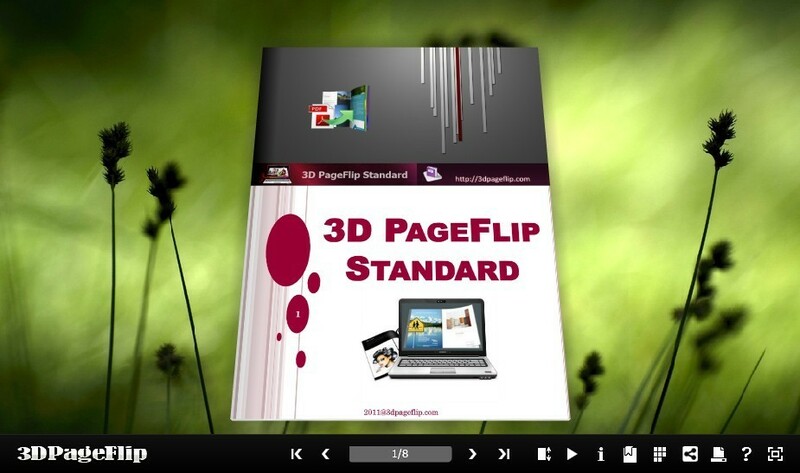 Note: All free 3d flippingbook Themes are available in any 3DPageFlip software. With those Themes & Template you can make more professional and interactive 3D Flash Flipping Book as you want.